Overlooking the Torridge, and now vaulting across the Tarka Trail by a stone-built pedestrian bridge, lies the cul-de-sac known as Vinegar Hill. We have, it has been suggested, the Irish Rebellion of 1798 to thank for this unusual name. Fuelled by the revolutionary fervour in France, and also American’s bid for independence, a French-aided armed uprising had been gathering momentum in Ireland since the spring of 1798. Volunteers were sought to bolster the forces available to counter this new threat of an Irish facilitated French invasion. It has been suggested that many troops bound for such conflicts in Ireland would have passed through Bideford. 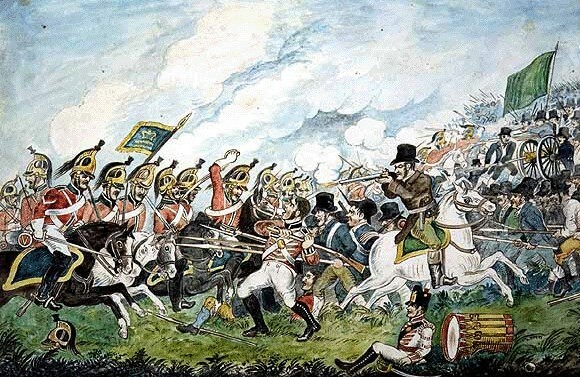 The rebellion was at its strongest in County Wexford, until, on 21 June 1798, an English force secured victory in the pivotal battle of Chnoc Fhíodh na gCaor, near Enniscorthy. The English won the battle, but then failed to get to get their tongues round the Celtic name. Chnoc they translated as Hill, but Fhíodh na gCaor (fee-na-gare phonetically and meaning “the wood of the berries”) was corrupted to Vinegar. Vinegar Hill, it is said, was named as a memorial to this English victory, though whether by men of Bideford who fought there, or by returning troops who passed through is uncertain (local’s will mention one or other version).